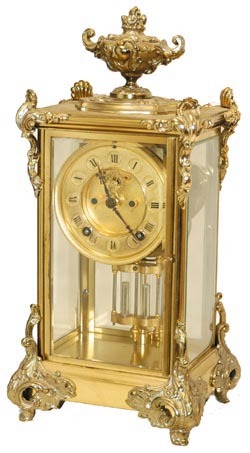 Ansonia Clock C., crystal regulator, "Marquis", C. 1904. Nice original case of polished brass and rich gold ornaments attached top and base. It has lost only a small amount of the original shine. 8 day movement is running strong, strikes the half hours on a standing gong, with an imitation mercury pendulum. Dial is a little different than we normally see on the crystal regulators. It is brass with recessed numerals painted black, open escapement, original hands, and all good. Four good beveled glasses on this 15.5" case. This is a dandy, clean clock. Ly-Ansonia #334.